Saffron an important and valuable spice product which is important cash crop of Kashmir faces decreasing production over the number of last 10 years. Saffron in Kashmir is known as “Zaffran” grows in the wide area of Kashmir valley. Saffron botanical name is Crocus-Stavas. Saffron word is originated from the Arabic word “Zaffran’ meaning yellow. This yellow spice is also known as ‘kumkum’ and ‘Kesar’ in Sanskrit, and also ‘Kung’ in Kashmiri. Even though a number of successful attempts were made to grow it in other parts of the country but the actual production of saffron its quality is only confined to Kashmir valley. Attempts were being made to cultivate saffron in Uttar Pradesh and Himachal Pradesh also in other parts of the Jammu and Kashmir state, like in Kargil region but it failed. In Kashmir, the Saffron spice is Cultivated in the Lusctrine deposits having an elevation of 1585 to 1677m above sea level. These uplands in Kashmir valley are known as ‘Kerewas’. These soils are calcareous in nature with average organic carbon and calcium carbonate contents of 0.35 and 4.61 respectively. The ph value these soils ranging from 6.3 to 8.3 respectively. 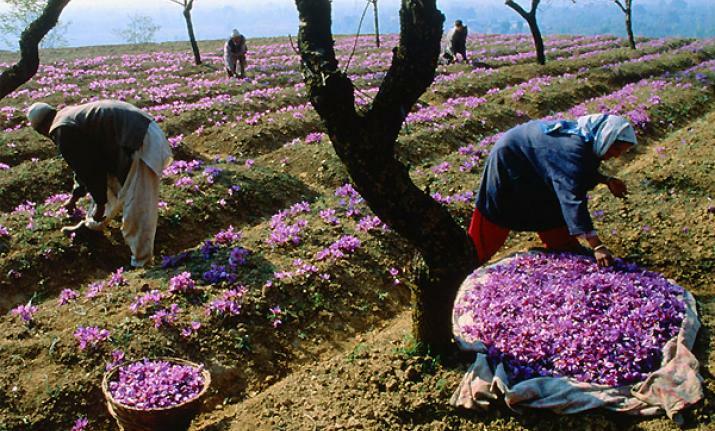 The major saffron producing areas of the world are Iran, Spain and Kashmir. Iran has a vast area covered under Saffron cultivation. Its Southern provinces are the major Saffron producers. Most of the saffron produced in this country is exported. Greece, Turkey, Morocco, Azerbaijan and France are other important producers of Saffron. The history of the saffron cultivation starts from 5th B.C Century as it is mentioned in Kashmiri records (Nurriyal et al., 1997). it is also mentioned in the famous history book of Kashmir Rajtaragni written by Famous historian of Kashmir Kalhana. It is said to be originated from Takshak Spring located in the east of Srinagar city about 10 km of distance in Zewen Village. After its origin in this village, its cultivation started in the neighbouring area. From its origin, the yellow spice has been used in Ayurvedic Medicines. But the Kashmiri legends the growing of saffron and where it has been brought is different. According to Kashmiri Legends, the Saffron was brought in by two Sufis ascetics, Kawaja Masood Wali and Shaikh Sharifudin Wali (r.a) to Kashmir Valley. According to Abul Fazil, there were twelve thousand bighas under Saffron cultivation in Pampore. According to Jehangir, the yearly produce of Saffron was about 500 Hindustani maunds, saying that, “it is not known whether such a huge quantity is grown anywhere in the world.” Kashmir is the second largest contributor of saffron to the global market. Pampore Tehsil of Kashmir (India) is the main hub of saffron activity in Kashmir. Khunmoh, Zewan, Balhama, Sampora, Ladhoo, Chandhara, Woyan, Khrew, Shar Konibal, Dussu, Namblabal, Kadlabal, Hatiwara, Samboora and Lethpora are prominent saffron villages of Tehsil Pampore. Though most of the saffron produced in Kashmir division of State is exported to the rest of India. But some amount of saffron is locally consumed. It has been used from ancient times. It was used as a strong aphrodisiac agent, antispasmodic, expectorant, sedative, eupeptic, carminative, diaphoretic, stimulant, stomachic, emmenagogue, carminative and an abortive agent. It has been used for the treatment of ocular and coetaneous conditions, lowering blood pressure and for the healing of wounds and fractures and joint pain; to prevent the plague and other epidemics; to cure anaemia, insomnia and other respiratory diseases. It is also known for its anti-gastric, antidepressant, anti-diabetic, anti-inflammatory, anti-genotoxic, antioxidant effect. It is also used in the textile industry as a dye. It is used in dying of high manufactured textiles of cotton, wool or silk. Besides, it is used as a spice in traditional dishes. Saffron has a rich history of being used in Kashmiri khewa and Kashmiri wazwan a favourite traditional Kashmiri food. It is used as a colouring agent for sausages oleomargarines, Dairy products such as butter, cheese and ice creams for colour and flavour improvement. The figure above shows the Area under Saffron Cultivation in Kashmir which shows a high area under saffron cultivation in 1997 decrease with the time which also led to a decrease in yield. Though the area under cultivation of saffron from 2011 to 2015 remains smooth, the yield of saffron decreases. The figure above shows how the production of saffron decreases with every year in Kashmir, despite some improvement in the production in some years. The decrease of saffron production in Kashmir has many causes. The most prominent causes of reduction in saffron decrease are as Lack of availability of water in the saffron fields; though the saffron crop does not require more rain for its proper growth. But the amount of water which is required for its proper growth is not available which led to a decrease in the production of the crop. Lack of irrigation facilities in the saffron cultivation area as most of the land under saffron cultivation depends upon rain which is not adequate for the growth of the saffron crop. Second nutrient deficiency in the land under saffron cultivation; most of the land which is under cultivation of saffron has suffered a nutrient deficiency. because after the production there are no methods which people adapt to renew the land whose deficiency of nutrients can be renewed by adding fertilizers, organic compounds and cow-dung cakes. The quality of saffron production has also decreased due to use of traditional methods of cultivation example saffron petals which are dried under the sunlight decreases the colour strength from 16 per cent to 8 per cent. One more important concern about the crop is that of adulteration and admixture; these two things are so administered in the saffron crop market that it becomes difficult for a person to know which saffron is pure. One more last and important thing is which should be taken into consideration is the illegal construction of residential houses on the saffron fields. According to experts about the recent findings that the saffron cultivated area which lies in Pulwama is under threat because of cement factories that are run in the area. Due to the establishment of these factories, the production has reduced from 150gm to 70g per Kanal (lone, 2010). In order to preserve the saffron government of India had sanctioned a mission called National Mission on Saffron in 2010, at first the GOI sanctioned crores rupees to increase the cultivation of saffron in the whole. Hi, my name is Muzafar Hamid. I have done Masters in Convergent Journalism from the Central University of Kashmir. I am a budding journalist. I am also a story writer. I have written for local news agency Press Trust of Kashmir and Kashmir age. My home land is Kashmir. My areas of interest are education, environment, lifestyle, agriculture and culture. I am also a blogger.